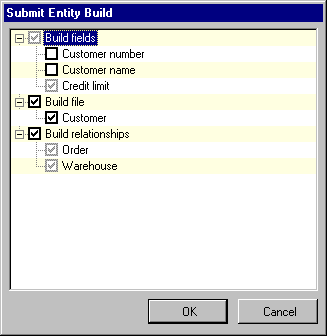 The Submit Entity Build dialog is displayed. You are given some flexibility over what phases of the entity build are performed. Depending on the current build status of the entity, the check boxes for the Fields, File and Relationships build may or may not be checked or protected, allowing you to select or de-select build phases or parts therein. Those fields which have never been built are automatically selected and cannot be de-selected – they are required to be built when you build the entity's fields. If the entity has not previously been built, all fields are selected and cannot be de-selected – they must all be built the first time the entity is built. These fields are indicated by a gray checkbox. If a field has been changed since the last build, it is automatically selected but can be de-selected if you do not wish to build it at this time. These fields are indicated by a ticked black checkbox. If a field has not been changed since the last build, it is not selected but can be selected for rebuild if you wish. If the file has never been built, or has changed since it was last built, the file is automatically selected. It can be de-selected if you do not wish to build it at this time. If the file has never been built, or if relationships affecting the entity have been added or changed, all relationships are automatically selected. They can be de-selected if you do not wish to build relationships at this time. If you do not wish to perform any build activity for the entity, press the Cancel button. Select Yes to display the Builder Queue, from where builds can be executed or No to return to the model diagram. For more information regarding building entities, refer to 3.13 Building the Model.